I've been following IE and how it relates to web standards for quite some time now. I haven't been all that vocal over the past two years because, mainly, IE has been moving rapidly and in the right direction. For all the progress made, however, Internet Explorer's detractors - many who are fans of the SCOFF Browsers™ (Safari, Chrome, Opera & Firefox) - are not so much interested in web standards as they are in deriding Microsoft and its products. IE's lack of web standards became a rallying point for them. But times have changed. Let's stop for a moment and take a look at IE and how it has progressed in just the past five years. Web designers five years ago complained about the IE6 Box Model. It was fundamentally at odds with the W3C Spec. They didn't bother to mention that IE6 was in the marketplace before the spec was approved. Still, the browser did not conform and the W3C Standard that was the measure of success. Surprisingly, despite being the overwhelmingly dominant browser on the planet, Microsoft succumbed to our requests, and altered its box model in IE7 and IE8 to the point where IE8 when released was as conforming to the W3C CSS 2.1 spec as any other browser on the market at that time. The SCOFF Browser crowd, never wanting to give ground to IE, moved onto less fundamental issues: Rounded Corners, CSS3 support, media queries, web fonts, ECMAScript event conformance, HTML5, the list goes on. Well, we awoke the giant, and Microsoft has a browser in development that is taking IE from worst to first. The IE9 team is going to release a watershed browser next year. Its CSS3 support is stellar, its rendering of border radius is superior to the SCOFF Browsers, handles web fonts, the W3C DOM event model, and excellent HTML5 compliance. And did I mention it's fast? Update: converted dead links to individual tests. Which brings us to the next conundrum for the anti-IE crowd. It seems that the only benchmarks that matter to them are those where IE does not win. Once IE shows conformance or superiority, the haters decide that a standard that was oh-so-important was never really important after all. Or, a test that was the defacto standard, is now fundamentally flawed and biased. To Microsoft's credit, it never allowed itself to chase a ghost. It did not chase any arbitrary or specific benchmark. What Microsoft did do was to analyze actual websites, and approach performance in a holistic manner. The IE Team produced charts and showed how different types of sites have very different load time profiles. This discussion was a breath of fresh air and sanity amongst the din of the scoffers. So let's move our attention to the SCOFF Browsers and start asking them why they can't keep up with IE9 in these tests? Why can't Safari produce dotted borders on rounded corners? Why is Firefox's DOM Capabilities lagging? When are Opera and Chrome going to improve their CSS3 box shadow support? And why can't anyone touch the IE9 HTML5 performance that makes HTML5 an application platform? The point here is that Microsoft, in IE9, is bringing to the market a browser that meets or exceeds expectations in nearly every area we have ever brought before them. And where web standards exist, IE9 is adhering to them. The IE9 team is to be commended for their effort, and Microsoft should be commended for waking from its development coma, listening to the web standards advocates, and producing a product that will draw users away from yesteryear's browsers. 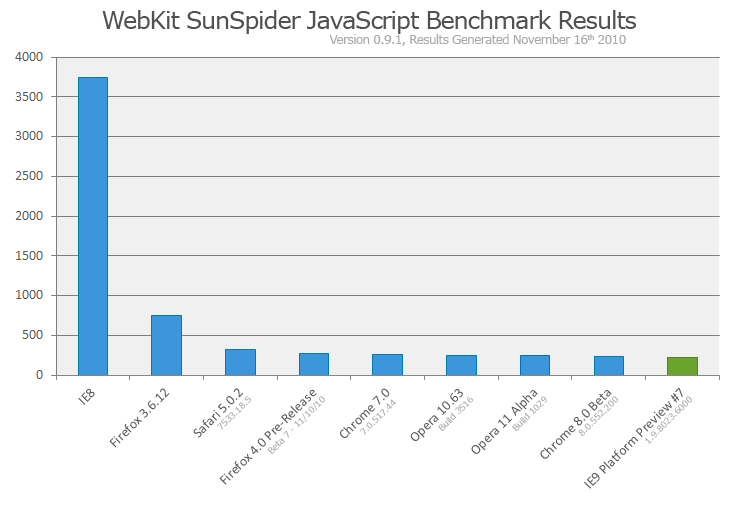 The problem is that while IE9 is an exponential improvement over IE8, you're overestimating how good IE7 and IE8 were. The normal webdevelopment/web design process is still develop your site based on agreed upon standards and most of the time it will look picture perfect across the SCOFF browsers (love the term btw). That should be the end. But then you have to open IE6, IE7, and IE8 to hack them into looking and functioning correctly. Some webdevs charge an additional fee just to support IE6 (as they should). The IE team is still responsible for IE6-IE8. They don't magically go away when IE9 drops. Who's fault is that? Microsoft's... which they are creating another line in the sand since XP (the most popuplar operating system to date), can't upgrade to IE9.... but I digress. While IE9 is exponentially better than IE8, that is not saying a whole lot. I'd rather have my finger cut off than my hand... but if there was a "neither" option, I'd pick that first. IE8 is a huge hole to dig yourself out of. MSFT is catching up to the pack. What they need to do (since they only release every few years) is beat the pack and be ahead of us for a few months. As much as you feel they are, the people working with the browser daily (i'm in that group), don't feel that is the case. In terms of the perf test, i thought we were in agreement that IE9 was not running tests that it should be http://twitter.com/carlcamera/statuses/5100174384832513 . If you think IE is handling the test fairly, then I should go make my own browser that detects sunspider and just returns 0 milliseconds for all the tests. It will blow the performance tops off all the browsers. The only thing IE that comes to mind that IE dominates at is anything hardware accelerated... which I think is jsut canvas at this point. Largely because, to my knowledge, no other browser is hardware accelerated yet although chrome and firefox are working on it... and one would assume so is Opera but you never know with those guys. The funny thing is that Opera without hardware acceleration is not very far behind hardware-accelerated IE9. One more thing about browsers making standards and then the standards changing... this is a common occurrence. One browser pioneers something and submits it the w3c, then the browser vendors get together and say it should really work this way instead and then the original implementor has to update their implementation. That's often how new standards are born. That's what's happening now with css3 gradients for instance. Webkit pioneered them but now we are deciding on the best way to implement them. Right now, Mozilla and Webkit have 2 competing implementations with different syntax. I fully agree that IE9 is a good browser. Apart from the fact that of course the majority of malware will always be directed at IE as long as it is the market leaser, I can't see a valid reason (for an end-user) to NOT use it. We are luckily now at a point were the choice of browser is for the most part a matter of taste. But I really don't understand why you defend Microsoft's past... They did do evil and - what is far more important, and probably the main reason for the hate directed at MS - they did it on purpose! @Fearphage: IE7 and IE8 were steps in the right direction. Of course, we as web developers now have even more browsers to test against. I don't think it's Microsoft's fault that folks still use IE6. They made IE7 a critical update, and even Digg (I believe) showed that folks running IE6 either could not update or would not update. There are third party applications written that are IE6-only. That's not Microsoft's fault. Still businesses are reluctant to upgrade. I'm not going to rehash the whole IE9 SunSpider optimization argument. Ars Technica has a nice writeup about it. As I said in the article, the JS Speed Wars are over, and we can thank the SCOFF browsers for IE's improvements. @Martin: I'm not sure which "MS did evil" you're referring to because it seems any action by MS, and success in any market, is percieved as evil by someone somewhere. Apple bundles a browser and offers no choice, but I don't see any outcry against them. And yes, you and I are in agreement that browser choice is finally a matter of choice. If any perception of mine was changed in writing this article, it is a greater appreciation for the Opera browser which handles more of the tests on the IE9 site best of all the SCOFF browsers.